Mayor Cory Booker told reporters about how he rescued his neighbor from a fire. Mayor Cory Booker of Newark, New Jersey, may have a new nickname. In April, some residents were calling him “Super Mayor” after he rescued a woman from a burning house. Mayor Booker says he was just being a good neighbor. He thinks that people should not call him a superhero because there are other people, such as police officers and firefighters, who save lives every day. Firefighters are happy that Booker rescued his neighbor, but they warn that fire rescue is very dangerous without proper training and equipment. Booker and his neighbor both went to the hospital to be treated for smoke inhalation and burns. Cory Booker has been mayor of Newark since 2006. He grew up in New Jersey and has been interested in politics since he was a kid. Even before his daring rescue, Mayor Booker was getting a lot of attention for his leadership in Newark. He has become known for his hands-on approach in running the city, and for his use of social media. During a blizzard in 2010, he used Twitter to organize the snow cleanup in Newark. He also helped shovel city sidewalks. In 2009, Booker turned down an offer from President Barack Obama to lead the new White House Office of Urban Affairs Policy. He wants to stay committed to his city. When British Prime Minister David Cameron visited the United States in March, he stopped in Newark to learn about what Mayor Booker has accomplished. Booker gave Cameron a walking tour of the city. He talked to the prime minister about ways he is working to reduce crime and improve the economy in Newark, where many people struggle with poverty. Cameron hopes that Booker’s work in Newark will inspire leaders in Britain to improve struggling cities there. Watch Mayor Booker read his inspirational poem “Sometimes” at the New Jersey Performing Arts Center in Newark. 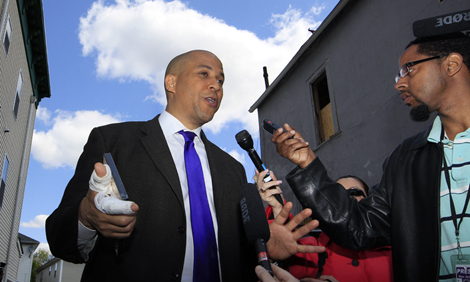 Why were some Newark residents calling Cory Booker "Super Mayor"? How did Mayor Booker use social media in 2010? He used Twitter to organize snow cleanup in Newark. He used Facebook to direct the police department. He used social media to manage new construction projects. He asked city council members to cast their votes using social media.